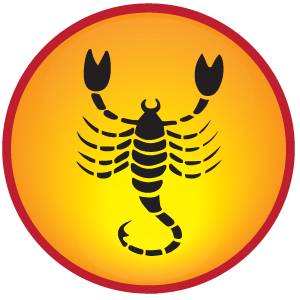 Scorpio Horoscope for 2012 indicates a promising year for the natives. Good professional satisfaction and improvement is seen for the natives this year. Good support of elders will come as a blessing in disguise. Cordial relationship with siblings will also be maintained in 2012. Scorpions will perform well in their career and profession. Domestic imbalance might disturb some. Change of place or residence is seen. Keep things simple, scale down and you will be successful. Inclination towards occult and yogic sciences is foreseen for the natives. Spirituality will increase and some will go very deep in these subjects. Laziness will curtail your productivity level. Please Note: The Scorpio Horoscope for 2012 given here are common for the natives of Scorpio and may differ according to an individual’s birth date and time. For a simplified, accurate & customized 2012 horoscope prediction, get your personalized 2012 yearly horoscope prediction report now. Scorpio Horoscope for 2012 is indicating to nurture more positive thoughts. Try to remain hale and healthy throughout the year. Avoid self medication even for minor complications. Mother or motherly person’s health could bring some concern for the natives in 2012. Old aged person needs more care and regular check up. Scorpio Horoscope for 2012 points out that finance will be average throughout the year. Have a check on your expenses. Expenses for philanthropic activities may be higher during this year. Legal cases and litigation will favor you bringing monetary benefits. Scorpio Horoscope for 2012 indicates that romance will be quite disappointing for the natives until mid 2012. More emotional disputes between the loved ones will be witnessed until May; however, the romantic front will lift up the spirits during the second part of 2012. Unmarried natives of Scorpio in 2012 may get married during the months of May to August. Plan a pleasure trip with your spouse, recharge, relax and explore. Let this year be a year of accomplishments!